The plant’s original name Tritoma comes from the Greek for thrice-cut, a reference to their long leaves with very clearly defined three surfaces. Uva is Latin for bunch of grapes, describing the inflorescent arrangement of the blooms. In 1794 the plant was renamed by Conrad Moench (1744–1805) Professor of Botany at the Marburg University to honor his friend, Johannes Hieronymus Kniphof (1704-1763). Moench founded the Marburg Botanic Garden and wrote Methodus Plantas horti botanici et agri Marburgensis in 1794, an arranged account of plants in and around Marburg. He was responsible for renaming other plants as well, honoring fellow botanists of some renown. Johannes Kniphof, professor of medicine at Erfot University was famous for his10 volume work, Botanica in Originale, published in 1764, comprising 1200 botanical illustrations produced by a unique method. Each specimen was coated with printer’s ink and then carefully pressed onto paper, a process still known as nature printing. 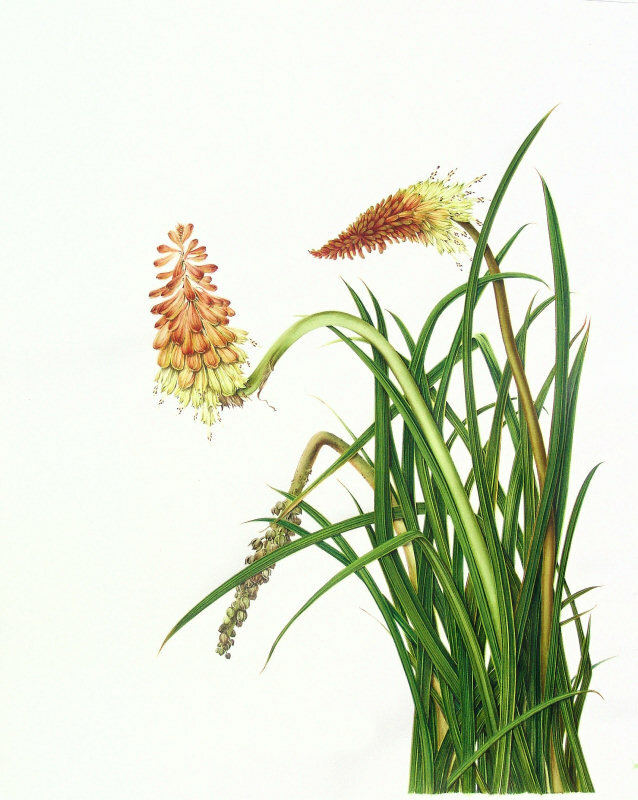 The plant that bears Kniphof’s name, native to Madagascar and South Africa, is also known as Tritoma, Torch Lily or Red Hot Poker—apt descriptors for its high-voltage colors and long tapering form. The brilliant reds and oranges of the trumpet-shaped inflorescent blooms are an invitation to hummingbirds on a summer’s evening. I have often surprised myself, and them, in their aerobatics as they seek the nectaries to sustain their frenetic activity! 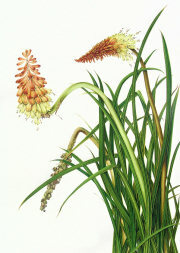 Recipient of the 2008 “Best of Show” award at the American Society of Botanical Artists annual meeting in New York.